Children's Beds There are 31 products. The Barcelona bunk bed is an elegant and appealing bed frame that would suit any child’s bedroom. 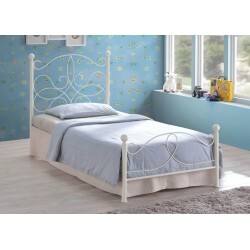 The Metal Three Sleeper is a beautiful and modern bed frame that will brighten up any child’s bedroom. Children delight in climbing up to their very own sleeping quarters at the top of the world! The Metal is a lovely and modern bunk bed that will save a lot of space. The Atlas bunk bed is a stylishly modern that would be a benefit to any bedroom. The Corfu is an elegant and stunning metal bunk bed that would be a benefit to any childs bedroom. A simplistic midi sleeper with mesh base and a fixed ladder in beech and ample storage space. The Nexus Triple Sleeper is a beautiful and modern bed frame that will brighten up any child’s bedroom. The Cotswold is a elegant and stylish midi sleeper that would be a benefit to any childs bedroom. The Cotswold is a elegant and stylish high sleeper that would be a benefit to any childs bedroom. The Cube is a stylish modern wooden bunk bed that would be a benefit to any childs bedroom. The Cube midi sleeper is a elegant and stunning wooden bed that would add grace to any child's bedroom. The Duo bunk bed is an elegant and appealing bed frame that would suit any child’s bedroom.